I have decided to specialise in restoration, so I was very fortunate to be given the chance to spend a week working with Iris Carr. I took a violin I’ve been working on and Iris talked me through how best to tackle its many problems, which include extensive worm damage, a pegbox with dangerously thin walls and floor due to a previous graft, cracks and plate subsidence secondary to worm channels. Iris was very generous with her time and introduced me to many materials and techniques that were new to me: we made a cast of the back of the pegbox using car body filler, with 25 micron foil as a separator, which has the advantage over plaster that you can add filler where the cast has a dip, as well as scrape high points. 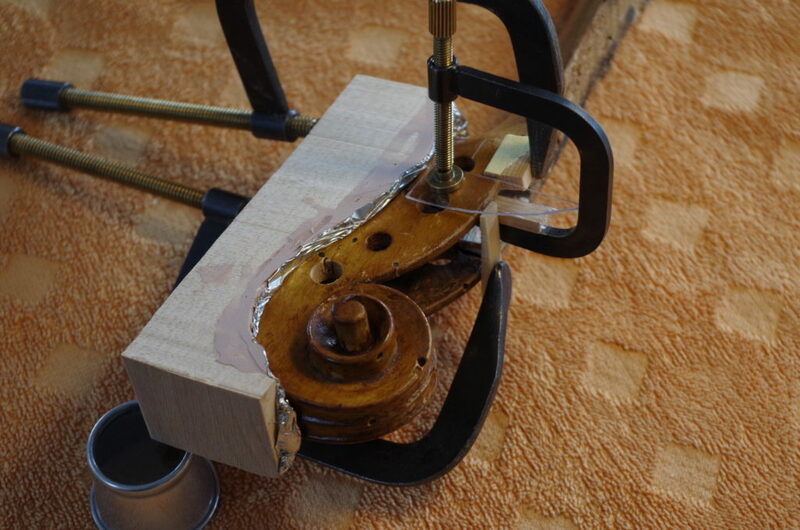 The back of the pegbox was so thin that I was able to correct the cast and steam the wood to restore its shape, prior to building up its thickness. I also corrected a cast of a violin plate Iris was working on, and we made a positive cast from it to assess progress. It was a fascinating and enjoyable week and I am very grateful to Iris for all her help, and to the RAB Trust for making it possible. I was offered a placement with Philip Ihle in London, and carved a scroll in the style of Stradivari. Philip asked me to think about form following function, and suggested I start by excavating the pegbox; this was something I’d always done at the end, but it became clear very quickly that there are several important advantages: there is as yet no carving to damage, the block is easier to hold, and it allows you to be fairly brutal when chopping out the waste (which is quicker). It was interesting having to visualise the finished shape so that the floor of the pegbox flowed appropriately, reminding me of painting negative shapes. 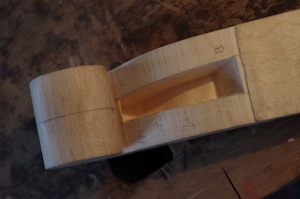 Philip cuts the chamfer early on and gets its trajectory right; its width can then be fine-tuned as you continue to carve the volute and cut the fluting. Again, this was very different to my previous experience and I found the process much easier to control. It made me realise that you have to question everything: there are lots of different ways to do the same job so you have to experiment to find the one that gives you the results you want in the shortest time.